Hello Marketers! 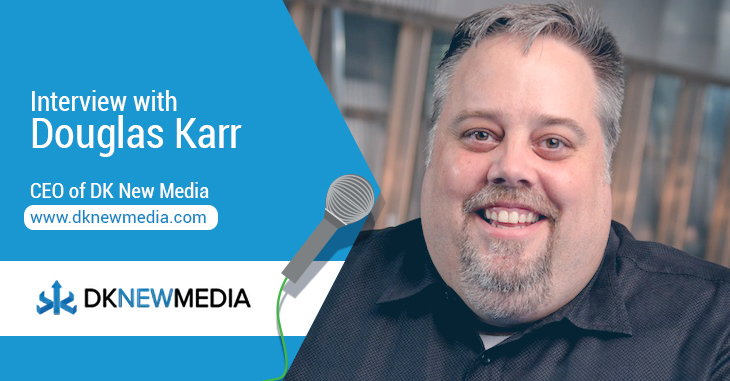 In today’s interview, I had the opportunity to speak with Douglas Karr, the CEO of DK New Media, the founder of Marketing Technology Blog, and renowned international author and speaker on social and search marketing. Douglas is one of the leading proponents in the digital marketing space for using big data analysis to tailor marketing efforts and using his expertise in planning and guiding marketing strategies of DK New Media’s top tier clients like GoDaddy, Angie’s List, and Mindjet. His book Corporate Blogging for Dummies was one of the first publications that taught businesses to reach out to audiences through blogging strategies and continues to be a great read for savvy bloggers. Douglas is also someone who has been in a wide range of roles – from serving honorably in the U.S. Navy, to being a product manager, and then getting into database marketing, co-founding a blogging platform (that went on to be acquired by Oracle), and finally starting DK New Media, he has seen and done it all. We reached out to him recently for an interview and he was happy to set aside some time for us. In the following interview, he shares with us his knowledge on several things digital marketing. Q. Quality content creation can be a tedious and time-consuming process with the amount of research involved. How do you manage to churn out so much content on the Marketing Tech Blog on a daily basis? Besides content curation, do you have any tips for bloggers to churn out quality content in a short time? A. In all honesty, I’m not so sure if it’s so much content. My goal is to put out two informative posts per work day and two posts on the weekend. There are a few thousand platforms available to marketers right now. There also dozens of enhancements to the platforms every year. If you do the simple math, it would require tens of thousands of posts per year simply to keep up. What I continue to look at is focusing on the prioritization of the topics, relevance to our audience, and ensuring any gaps are identified, researched, and produced. I have over 50 drafts on my blog – topic ideas where I’m waiting for a response back from a resource or time to do additional research. My goal isn’t to write a perfect article; it’s to get the information out there as quickly and accurately as possible, and then continue to expand the content as information is found. My tips for bloggers to churn out quality content is to ensure you have something valuable to your audience and do not hesitate to click publish. Q. You recommend a content strategy that involves the use of earned, paid, shared, and owned media. Can you give us some examples on how each of these marketing channels complement each other? A. While we predominantly utilize owned media to drive people back to our properties, we want to raise the awareness of our content through relevant sources elsewhere. I view our strategy as a pyramid with our blog being the very highest point. Earned media naturally comes as we develop new rich content that other sites see value in and share to their audiences. We also utilize public relations to increase our visibility to targeted earned media resources. Shared media extends our reach significantly, and we utilize it to drive traffic back to our site. Paid media is something that we tend to use sparingly. While we could drive a lot more attention, I don’t want to artificially inflate our image in the space by buying visits. Q. DK New Media is a company that diverted from the agency route and chose to service clients that are from the marketing and technology niche. What was the main reason for such a transition? A. I’ve worked in online marketing since the inception of the Internet. I’ve personally worked with and for some of the largest software as a service provider in the marketing industry. That experience is valuable and we’ve used it to help launch dozens of other companies and assist in helping them develop their platforms. Through the Marketing Technology Blog, we have an audience. Through my work, we have experience. And through the agency, we have the best network and resources in the industry. No other agency can compete with that. If you’re going to start an agency, you have to work in the area you love and can succeed in. For us, that’s marketing technology. Q. You do recommend paid advertising to outreach competitors. Which is your favorite paid advertising channel? Can you give some examples of strategies that you have used successfully? A. If you’re looking to extend your market share, you have to reach your market. If that market is owned by someone else, you need to pay to reach their audience. This is what our sponsors on our publication do with us. A typical example we often deploy is identifying a topic on our client’s site that attracted engagement and conversions for our client. We respond by diving deeper into the topic and developing an infographic and, more often than that, a white paper. To ensure a return on investment, we spark interest by bombarding some sources with small campaigns, including Facebook, LinkedIn, and StumbleUpon. Our goal is to spark interest, not drive ongoing campaigns. StumbleUpon has been very successful for this. Q. What are the 3 most common mistakes you’ve spotted in the blogging strategies of digital marketing agencies? A. 1) Not writing consistently. 2) Writing about themselves too much. 3) Viewing content as a production of a series of finished products rather than a collection of parts in an overall content library. Q. On your blog you advocate the importance of authority in having a successful content marketing strategy. Do you have any advice on how digital marketing startups can build niche authority for their clients both locally and globally? A. Authority is something that’s provided to you by your audience or community. You can’t agree with everyone and become an authority. You must differentiate yourself, not be everything to everyone. If there are better resources for your audience to attain knowledge in certain areas, stop trying to compete with them. Instead, point your audience to them. We advocate a process called Content Authority where you analyze and improve content in the areas you have traction. Over time, your authority will expand as you become known as an authority in very specific topics. Q. Compendium, the blogging platform that you co-founded with Chris Baggott has changed a lot since it was acquired by Oracle. Are you proud of what it has become? Also, what content optimization and blogging platforms do you use intensively? A. I’m not proud nor ashamed of my work with Compendium. It was a great business learning experience, having never been involved in a startup from scratch before. The company pivoted a few times to take advantage of the market and that was good for the shareholders and the city. Of course, saying Oracle bought the company you started is always a cool thing. It’s important to note that the original plan for the platform was honestly never realized (but still could be). The problem we identified was that blogging was difficult – from the optimization of the site to naming, categorization, tagging, and measuring the impact of articles. In my opinion, it’s even more of a complex process nowadays than it was then. Q. Can you detail how you use predictive marketing to analyze or optimize a marketing strategy for big companies? Also, can you explain how small publishers and agencies can mimic this route for analyzing and developing well-planned marketing strategies for their clients? A. Utilizing a ton of data sources we’re able to identify the content that drives business results. We can then identify the content that’s missing and prioritize it for increased business results. It’s a long-term strategy that requires a lot of resources and momentum, but it’s worked extremely well for our clients. It’s a strategy that drives home working on your strengths rather than wasting resources on work that can not compete nor accomplish your business goals. Q.Your book, Corporate Blogging for Dummies, is one of the most authoritative and detailed guides on how companies can grow their online presence through blogging and develop an inbound marketing strategy. What inspired you to write the book? Do you plan to author any other books in the future? A. Well, thank you! While developing strategies for dozens of clients – both large and small – I saw that there was a huge gap between the bloggers that were writing for personal gain and the corporations that wished to engage with their audiences. Kyle Lacy wrote Twitter Marketing for Dummies and pitched Wiley that my book would be ideal for them. I teamed up with Chantelle Flannery, a colleague that I worked incredibly well with, and we wrote a book that still stands the test of time (outside of some outdated platform changes and organic search advancements). Q. In Chad Pollitt’s words’, “SEO is not something you do anymore. It’s what happens when you do everything else right.” What is your take on this? A. Years ago, I caught quite a bit of heat for calling the SEO industry dead. The industry had become a dirty $5 billion industry of people who understood how to intelligently game the algorithms. As a result, some of the largest companies invested heavily and rose to the top of the search engines without the true authority of the industry to get there. We were seeing a continued problem where these companies were ranking well, but not converting well. The industry had figured out the math associated with search algorithms but lacked any marketing intuition on how to convert the audience. Marketers who did an amazing job were being overrun by backlink farms. We handled several clients that had unknowingly fallen victim to these strategies, and we became recognized as an honest SEO resource that had turned around several very large companies. If you asked these SEO consultants, they thought they were doing nothing wrong. They still refuse that they’re doing anything wrong. Unfortunately, there’s a huge percent of that industry that continues to do damage to their clients today. The algorithms have caught up with them. SEO is no longer a math problem, thank goodness. It’s back to becoming a people problem – also known as marketing. Chad’s quote is perfect. There is some baseline optimization that you should do simply to assist the search engines in indexing your site. However, the ranking of your content is ultimately dependent upon its quality and popularity. Jay Baer has done research that the average blog posts costs a company $900, and 80 to 90% of your traffic comes from 10 to 20% of your posts. Stop worrying about quantity and start investing in quality. “True authority doesn’t come from buying audience; it comes from impressing it.” I love this quote and completely agree. Thank you for sharing your knowledge with us, Douglas, and for taking the time to answer my questions. 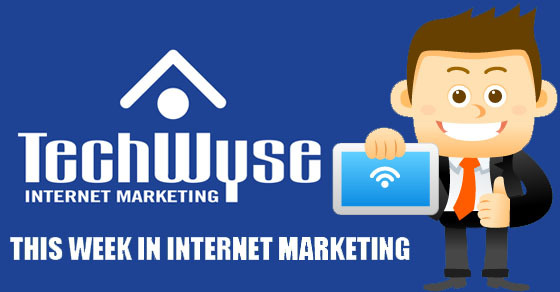 We will continue to interview great marketers on TechWyse Interviews. You can read more of our insightful interviews here. Adi is a round the clock experimenter, he loves to blog, reverse engineer websites, and to be proven wrong. The last one was a lie. Thanks so much for the opportunity, Adithya! You’re very much welcome Douglas! Thanks again for all the insights.